If only there were one tool for cutting tile. Unfortunately there's not. By assembling a number of tools--some expensive, some not--you can make every kind of cut you will need to tile your bathroom wall, kitchen floor, or backsplash. Cut lots of tile for at least one room of your house. And you want those cuts to be perfect, straight, and trouble-free. Table-top wet tile saw such as the SKIL 7 Inch Wet Tabletop Tile Saw. 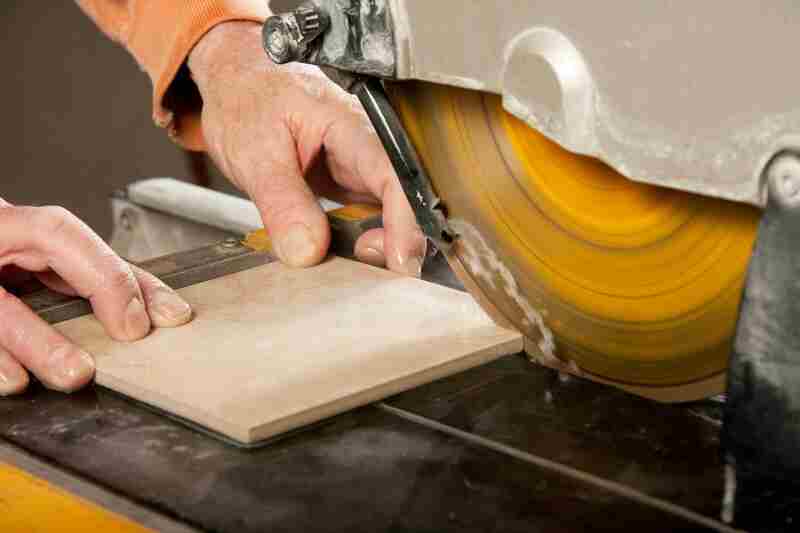 A wet tile saw, if you decide to outlay the cash, will take care of a number of other manual tile-cutting tools. But it will not do everything. In simple terms, a wet tile saw is a table saw like a type you might use to cut wood, except you use a carbon blade made just for cutting tile and you have a continuous stream of water hitting the work material. Try as you might, it is not a process you can duplicate with other, non tile-related tools; you pretty much have to buy a wet tile saw. Wet tile saws do not have to cost a fortune. Keep in mind that their value may be limited. They might last only the duration of your whole house renovation. If so, consider it money well-spent, as hiring tile installers is an expensive proposition. Cut out an installed tile, either the entire tile or a portion of it. Manual wet tile saw, regular circular saw with tile blade, or oscillating multi-tool. Before taking a sledgehammer to the entire tilework or calling in a professional tiler, consider removing the affected tile on your own. A manual wet saw is your cleanest, safest option. Some, like the Ryobi 4" Tile Saw, go for less than $100. These work just like an ordinary circular saw, except for the continuous spray of water that is fed by a tube. Any dry circular saw equipped with a four-inch diamond blade can do the job, but it will get ugly. There is a reason why tilers use wet saws. Tile cutting is dusty and dangerous, with the potential for flying shards of sharp tile. An oscillating multi-tool like the Bosch Multi-X is a good way to surgically cut away the grout that binds the affected tile to​ the surrounding tile. Cut a few tiles, without spending a lot of money on a specialized tile tool. The cut end of these tiles will get hidden under a baseboard. Snap tile cutter such as the QEP 24-Inch Tile Cutter. Snap tile cutters work like glass cutters, with carbide wheels that score into the surface. Also known as rail cutters, they allow you to put the tile in place, zip the wheel across the surface, press the handle for a satisfying "snap" as the tile is cut. The downside is that snap cutters do not give you flawless lines (as a wet tile saw would), but this is acceptable if the ragged edge will be covered by something like baseboard. Nip off small portions of an individual tile. Tile nipper such as the ​M-D Compound Tile Nipper. Call it a tile nipper, nibbler, or whatever, this is the most dead-simple tile cutting tool you will buy. It looks like a set of spring-loaded pliers, except the "jaw end" of the tile nipper, has two hardened, carbide blades. These blades are very dull and allow you to systematically nibble away at the edge of​ the tile to make curves. Create a hole in the center of a tile or for tile nips. RotoZip or other rotary cutting tool. What about cuts within the tile, such as circles for pipes, rectangles for outlets, etc.? A RotoZip has a blade like a rotating drill bit, except it moves exceedingly fast and the sides of the bits are covered in diamond grit that bites through ceramic tile. A RotoZip will cover tile nipper duties but will not make good straight lines. RotoZips are expensive, but you can use them for a multitude of remodeling (and non-remodeling) tasks. RotoZip has 6 bits just for ceramic tile. Is Tiling Hard to Do or Just Hard to Do Well? Tile Mastic: What Is It and Where to Use It? Can You Identify These Types of Tile That Look Like Stone?